The type of geometrical recursion associated with "visible creation space" (vector, conservation laws) does not exist in relation to "invisible creation space" (scalar, scalar laws). It is hypothized that in the latter case, the recursion and related symmetry breaking are demonstrated by the geometric nesting of the regular polyhedra, and that this is what causes synergy (the reverse of entropy). The concept is evolved by showing how the nested polyhedra form a resonant Fourier spectrum of synchronized scalar field action. Tetralogic is founded on the idea that, without pre-existing conditions, the Four (Aristotelian) Causes can only express recursively. That is, the Formalis holds within itself all the four causes, ect.. (http://science.trigunamedia.com/fundamentals-of-tetralogic/). 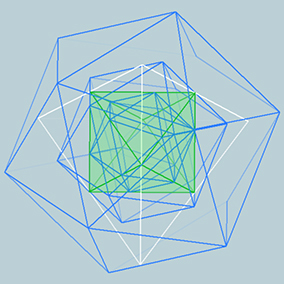 The geometrization of the groundstate, especially through the regular polyhedra, is not trivial. It was shown that in terms of visible creation space, bifurcation is imminent through the recursiveness of the associated geometries. For invisible creation space there exist no such geometric decomposition, and the synchronized action of the groundstate would remain unnoticed, were it not for the recursive nesting of the involved polyhedra. The breaking of the symmetry then takes the form of the sum total geometric nesting of invisible creation space. 1 - 0 1 - 0 1 1 - 0 1 1 0 1 - 0 1 1 0 1 0 1 1 , etc.. This is a "Fibonacci word", in other words F(n) = F(n-1) + F(n-2) represented in the form of a string concatenation, and a fractal (it is not a binary representation of Fibonacci numbers). The fractal seed is highlighted - quite literally the "symmetry breaking 101". Another way of demonstrating the uniqueness of the nested polyhedra is through spectral decomposition of the Synchronized Path Integral, which is thought to represent the triality through scalar field excitations. That is, if the heterodyne synthesis of at least 3 (usually sinusoidal) oscillations is Fourier analyzed, the result is the same binary fractal. The Synchronized Path Integral and its spectrum analysis, forming a "Fibonacci word". The example shows the Fourier transform of 3 Phi-ratio waves in heterodyne synthesis. 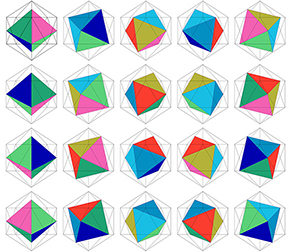 Matching the nested regular polyhedra with the "Fibonacci word" spectrum of the triality. 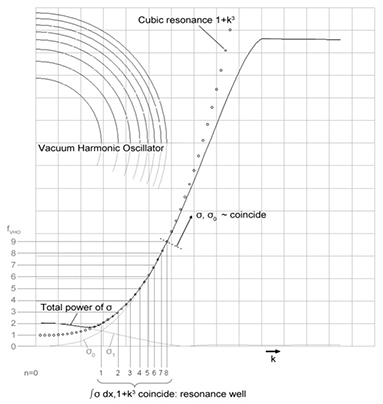 The presence of Phi3 (icosahedral) recursion hints at a volumetric groundstate resonance which however at this stage is still somewhat theoretical. 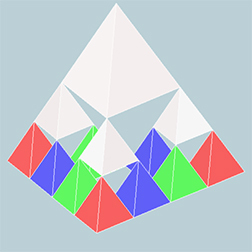 Its application within the receptacle of, in particular, the balanced 5 octahedrons, breaks the symmetry, producing a fractal decomposition of the ground state in additive synthesis, with at least a weak geometric coupling with the triality. Now the action has become truly volumetric, capable of having a physical effect. This means that the otherwise hidden groundstate can now function as a morphological seed or -field (autogenesis). It should be noted that the "triality" does not always mean "3 waves", but the triad of ratios defining a set of n synchronized waves in heterodyne synthesis. 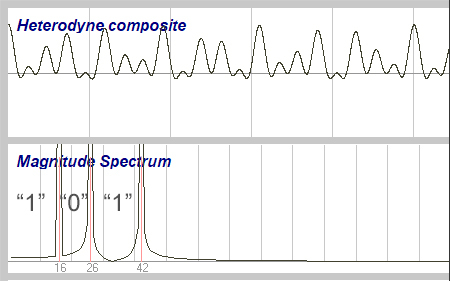 The number of waves or frequencies after spectrum analysis, that is, in additive synthesis, is apprx. Phin. Three nested icosahedrons resonant with the "Fibonacci word". One of the 5 octa's breaking the symmetry is drawn. 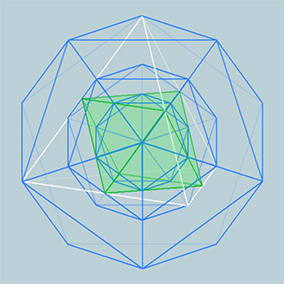 This means that a geometry of symmetry breaking in invisible creation space has been demonstrated, centered on the icosahedron and its 5 nested octahedrons and, perhaps more importantly, it is shown to be resonant with the triality. In comparison, symmetry breaking in terms of visible creation space is associated with normal (atomic, chemical, human) interaction under the jurisdiction of conservation laws (Noether). In the 1980's, Institute of Heart Math (IHM, Calif.)) studied heart rate variability (HRV) in relation to breathing and psychological states. They distinguished two types of HRV coherence: "Physiological coherence", based on the effect of monotonic breathing on the heart rate, and "Internal Cardiac Coherence (ICC)", consisting of (not well explained) transient coherence states in the heart rate. The latter was studied independently since about 2000 by TrigunaMedia and developed and succesfully marketed for practical therapeutic etc. use. TrigunaMedia explains ICC as the result of a fractal HRV pattern (caused by a range of psycho-physiological factors), identical to the "Fibonacci word" spectrum. With regard to the brain, a similar principle is hypothized, but less studied sofar. The 20 proteinogenic aminoacids are grouped based on the morphology of their NH2-C-COOH groups. There are 20 elements and 20 permutations, hinting at a recursive principle. 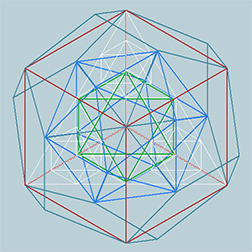 The 20 permutations result from 4 permutations of the octahedron (with regard to a given axis), times 5 octa's in the icosahedron. 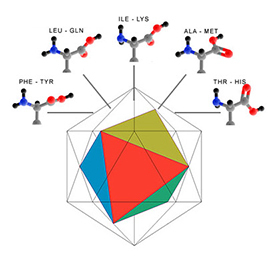 Not only is this a virtually literal implementation of the polyhedral synergy discussed in the present article, but also the aminoacids (arguably) represent the very initial stage of life, straight out of the atomic world. 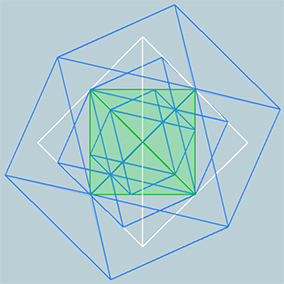 The nesting of the regular polyhedra was shown to have a recursive as well as a symmetry breaking aspect, the latter turning the former into a fractal with the capacity of a morphological seed or -field. As a whole, the nested set could be viewed as being the counterpart of symmetry breaking through geometric recursion. The polyhedral action can be spectrum analyzed providing further indication of an increase in synergy. - While the intrinsic groundstate recursion here is referred to as "symmetry breaking" with regard to both visible and invisible creation spaces, in a (somewhat philosophical) cyclic approach ("cycle of creation"), the visible wing contains the symmetry breaking (creating energy), while the invisible contains the symmetry restoring, that is, the positive albeit hidden action of increasing synergy. - The role of the icosahedron is fundamentally important to the tetralogic of co-creation, as it (re-)unites the "objective" and "subjective" (Formalis) tetra's. In other words, while co-creation may be universally modelled as the dual Formalis' coming to an agreement, it must be the shared internal icosa's which, through fractal resonance, initiate real synergetic action. - The 10 octahedrons of the dual, synchronized Formalis' suggest, at least a numerically, a relation to the 10 oscillatory peaks within one period of the synchronized ("triality") wave and thus perhaps the 10 degrees of freedom of quantum fields in high resp. low energy physics. - The "Fibonacci word" fractal nesting also appears to apply to the dodeca / cube set, which could be a topic of further research. - Classical quantum physics has in fact gone through iterative steps of obscuring synchronized action - Bohr model, De Broglie waves, Schrödinger Wave Equation. Modern Quantum Field Theory may still have the potential of lifting the reductionistic spell, provided it is understood that the Higgs boson is not the last word there is to say about the scalar field. The last word is, as proposed in the present work, the "Fibonacci word" - that is, the synchronized action of the scalar field. 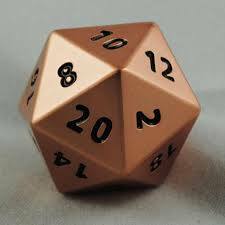 Or in the line of Einstein: God does play dice afterall, but the dice may be icosahedral in shape, instead of cubic.